A few months back, R_Block succeeded where roughly 52% of crypto-based projects have failed. It smashed its ICO token sale target, raising over $2.8 million. In this post, we analyse how they did it and how they used Maître to achieve their goal. R_Block is a decentralised hiring network and work ID proof platform, serving both employers and professionals. Individuals can use it to prove their experience or professional reputation. Companies can use it to get reliable info on job candidates, including their work history and accomplishments. It uses a token to incentivise sharing and checking of information by companies. To deliver an effective token sale, a team will require a mix of managerial, development and marketing talent. The team is one of the main drivers towards people investing, so it’s crucial you get the dynamic right. It’s important they have domain expertise as well.Investors tend to trust those teams more. In R_Block’s case, the proficiencies were brought by Co-founder Luke Shipley, CTO Peter Brook and Marketing Director Charlotte Lucy Hall respectively, with an extra marketer and an extra developer completing the core team. Additional developers were brought in as required on a part-time or equity basis – a common practice in token sales. If you’re looking to add find talent to your own team, try posting on Cryptocurrency Jobs. There are options to list full-time, part-time, contract and commission based roles. With a strong team in-place, R_Block could turn their attention to strategy. Firstly, which type of token to sell? Utility tokens – representing access to service. R_Block’s token, CVT, would ultimately become a utility token – something that was well suited to R_Block as it could become a medium of currency within their product. Most importanly using a token of this kind satisfied their investors that it was likely to grow in value over time – a crucial component to any token purchase by an investor. The CVT was delivered as an ERC20 Token running on the Ethereum network. R_Block’s token plays a multifaceted role. It enables basic product usage, value exchange, enriched UX for engaged users and the distribution of benefits to investors. Defining these characteristics and effectively communicating them to prospective users was crucial. Key to this process was the creation of R_Block’s whitepaper, a process which took around 4-5 months. Not only would this provide an essential marketing resource; it would also help give direction to the project in general. The whitepaper is your chance to get down the vision of where your product is going, both technically and commercially. It should lay out exactly what people are investing in. You should be describing the “tokenomics” of your ICO. Tokenomics is a fancy word for what the tokens you raise money for are actually going to be used for. The aim is for people to read the whitepaper, understand your product and be sufficiently inspired to want to part with their hard earned crypto and invest. In R_Blocks case they actually wrote the whitepaper in house, which is quite unusual as there are specialists that can help in this. On the one hand, going it alone with their whitepaper helped R_Block refine their overall strategy. On the other, it could have been achieved more quickly with the help of a technical writer. Shipley wrote about the pros and cons for Hacker Noon. Those of you who’d prefer to leave it to a specialist should be able to find the talent at Cryptocurrency Jobs. 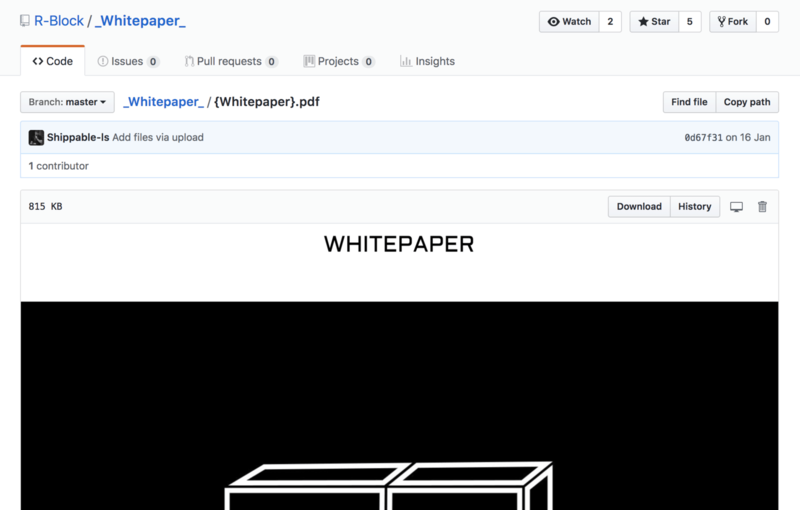 Interestingly, R_Block actually published their whitepaper on Github, a homage to the tech nature of their product and ICO. R_Block’s next key step was the development of its Telegram group, which has come to serve as the platform’s main chatroom and community communication channel. Building a vibrant Telegram community is an essential component of any successful ICO, in fact, it’s often cited as the most important activity. Why? because it helps show social proof and quickly removes any doubt that it may be a scam, a massive problem in the blockchain/crypto world. The size of your Telegram community also serves a useful gauge to investors as to whether or not your product is something to get excited about. “It’s an essential tool for crowd sales, as it’s where most people who’ll get involved will be hanging out,” says Shipley. Use the Telegram community as a way to warm up your investors as to what you’re about. Post regular updates on your product development, where you are pitching next or relevant industry content. Always be sure to be responsive. Be quite literally the window into your companies operation. Fail to reply and people will call you out as a scam. or newsletter send them to the Telegram community. “I don’t think anyone searches on there for your company. They discover your platform elsewhere, and then go to Telegram to gauge interest. It’s important to be responsive withpeople there, and to keep a good environment” reckons Luke from R_Block. The key to keeping your Telegram community alive and kicking is to create unique value and interest through content that’s relevant to your target audience, and to drive engagement with relevant on-platform messaging. SocialMedia.Market have good advice to offer on this topic. In R_Blocks case they made sure they had the finger on the pulse posting regular recruitment industry-specific news as it hit. This ensured they were seen as the influencers in this space. 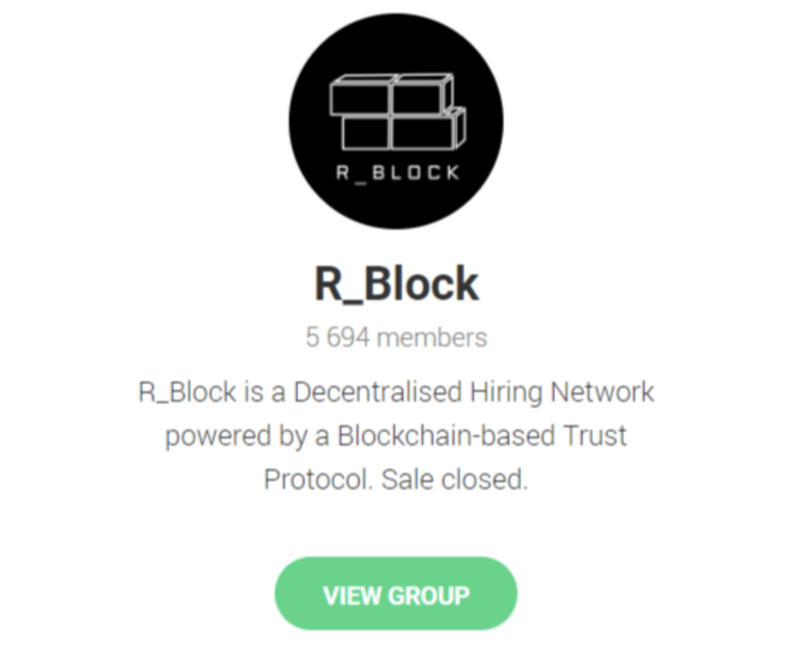 In the end, R_Block achieved 5,694 subs (at time of writing), they still update the community today as it is the place where all of the investors hang out and stay engaged. These online marketing methods couldn’t have thrived to the extent they did without supporting offline activities. Most of your investment will actually be raised from face to face pitches at blockchain and crypto events. For this reason, it’s crucial you go to the right ones as there are a lot of time wasting and expensive ones. The aim of these events is to link up with as many industry big-hitters as possible to get investment, this usually a combination of angel investors, VC firms and press people. Before you go to an event make sure you try to link up beforehand with as many potential leads who are going to the event as possible, arrange to meet them at a time and place at the event. Hint: don’t be this guy. There are a few ways you can find out who is going to the event. Ask people of popular crypto Telegram groups, LinkedIn ICO groups or even ask your own LinkedIn network. You can even ask the event themselves, most will usually publish who their speakers are, which is at least a start. Ideally, you should aim to have your calendar full of meetings throughout the course of the event you are at. Aim to never go to an event with an empty calendar. “Going to industry-specific events generated most of our larger investments and is key to making sure you are you some way towards your target capitalization the day your ICO goes public” Said Luke. Check out the list Luke and his team used. Raising an ICO is just like crowdfunding on popular platforms like Kickstarter. You should never go public on the crowd investment without already having a healthy % guaranteed as an investment. What ICO’s call the private sale. The reason for this is no one wants to be the first person to invest, and it looks terrible if you go public on the ICO and there is only 1% invested towards your target cap, it doesn’t exactly signify a hot product to invest in, does it? It’s also telling, as all of the legitimate ICO indexing sites are literally tracking your capitalization %. A rule of thumb is around ⅓ of your investment cap should be raised privately (The reason events are crucial), so that when you go public you are already beyond the 30% mark. If you are smart it’s also a quick way to become one of the ‘Hot’ ICO’s listed on an index, because if you go public and within a couple of days are already at 30%, this is tracked on websites like ICOalert.com and will lead to a more favourable position on the index. “Before we went to the crowd we already had most of our investment raised from private investors, mostly a few angels and couple of VC’s we met at events” Luke from R_Block. Having all of the foundations in place for a successful ICO, R_Block now had to nail the public sale. This would require a range of marketing activities, including online and offline campaigns. 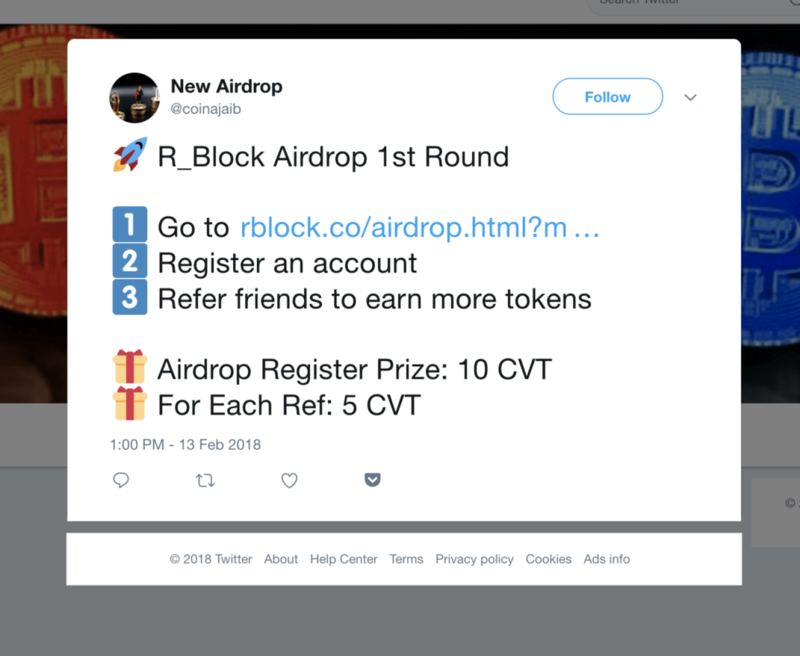 One such activity was crucial to its success, referral marketing, and R_Block used the Maître viral lead magnet to drive interest in an AirDrop campaign. Participants were offered a range of rewards, in return for referring other people to sign up. Incentivising people to share in this way is a surefire way to ensure your product leverages friend-to-friend referrals, which is crucial in an ICO since a large proportion of people are paranoid it’s a scam. All of this would be backed up by online PR and social media marketing. Again, this is both for driving traffic and for great for social proof. Believe it or not, this is actually more of a challenge than it seemed. To distribute their token, R_Block downloaded data from the blockchain to confirm who’d contributed, crosschecked who’d passed the KYC process, then created bespoke code to send the tokens out. If you’d prefer a readymade solution, checkout Sparklink to be able to do this automatically. 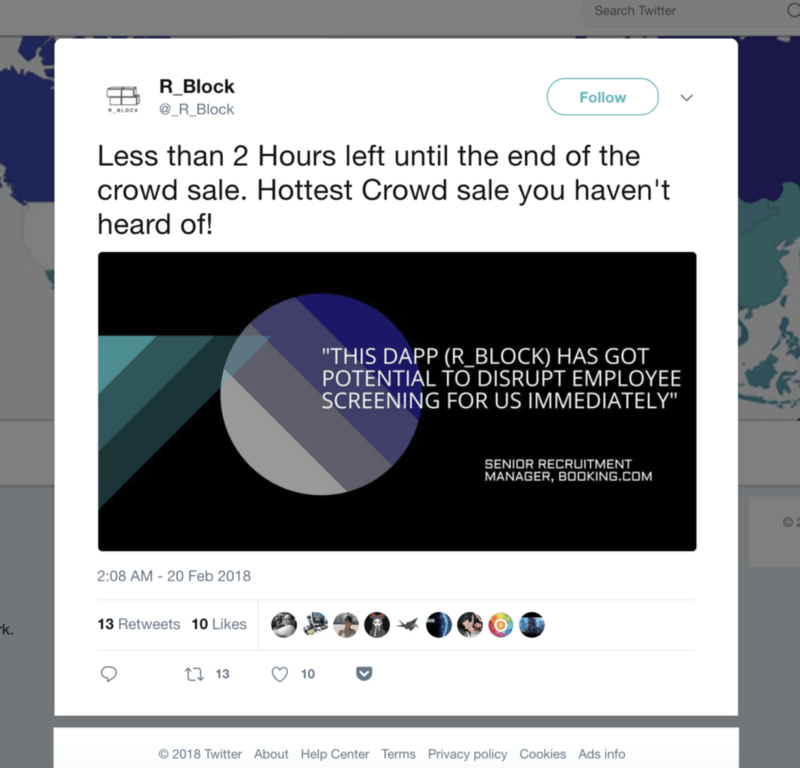 With a high volume of interest driven by their marketing activities, plus a stable basis for trust in the form of their whitepaper, face-to-face events and the Telegram, R_Block had put in-place all the vital ingredients for their crowd sale’s success. From its start on January 30th to its end date of February 20th, the sale saw investors snap up CVT to the value of $2,862,754. In that time period, they built a newsletter with over 60,000 subscribers and a vibrant Telegram community with more than 5,000 subs. After several months of work and one highly successful token sale, R_Block is ready to change the face of online recruitment. Emulating R_Block’s referral marketing technique takes a good amount of planning and/or consultation. How will you incentivise referrals? Will you use community tools like Telegram to support the process? How will you optimise your referral link content for social media? To learn how book a meeting slot here.